Your donors are a crucial part of your success. Thanking them for their support is not only a good idea, but also a requirement for charitable organizations when “a donor receives goods or services in exchange for a single payment in excess of $75,” per the IRS. 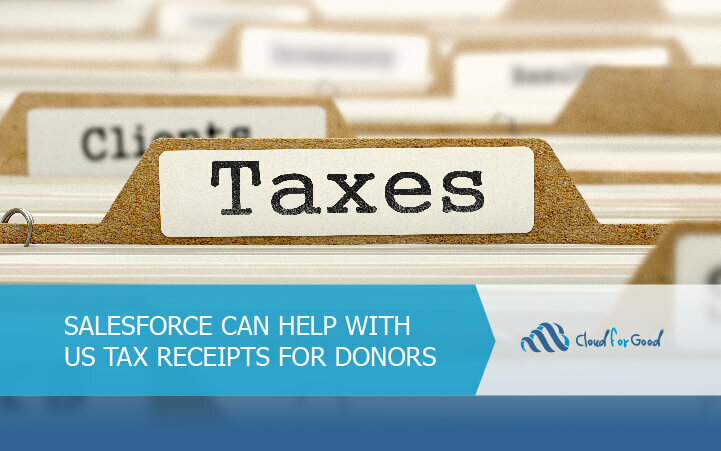 Additionally, a donor is required to have a written acknowledgement of any single contribution over $250 to claim it on their federal tax return, and while it is not a requirement that the organization provide it, taking a proactive approach will help show your donors you appreciate their support. For a donor to claim a contribution on their taxes, they need to receive this by the date they file their taxes, or the due date for filing, whichever is earlier. Typically, most organization send these out by January 31 for donations made in the prior year to allow their donors time to file. You can read the full IRS documentation on Charitable Contributions here. Trying to keep track of this outside of a database is difficult even for the smallest donor base, and unmanageable as the number of donors grows. Fortunately, Salesforce can help keep track of this information and streamline the process to let your team focus on the other important work to be done. The IRS allows for these written acknowledgements to come in many forms, including email or written letter. If you installed the Nonprofit Success Pack (NPSP) after July 2015, you already have this feature enabled. If you were before that, there are a few steps to follow to get it up and running. Once enabled, you can edit the NPSP letterhead with your logo, and you can edit the NPSP Opportunity Acknowledgement template to include whatever language you’d like. With this feature, you can either use the Email Acknowledgement button on an individual opportunity record to send a thank you to one particular donor, or send multiple emails at once through a list view. There are already automations in place to update the acknowledgement fields on the opportunity so you don’t need to worry about keeping track of who you’ve already sent letters to. If you’re prefer to put the letters in the mail, or use other features of a mail merge tool you can use a tool such as Conga Composer, Drawloop or Apsona Mail Merge. These tools vary in their features, but all of them will allow you to create a template that you can pull information out of Salesforce. You can then download the files to print and put in the mail, or depending on which tool you’re using, send an email with an attached PDF of the thank you. If neither of these options meet your business needs, there’s always the option to customize the process. You could use Process Builder to automatically send an email out after a donation has come in, or you could simply have a report of the people who have not yet received their letter yet. The customizability of Salesforce is one of its greatest features, and this process is no exception. While sending out thank you letters might currently be something that takes months, or gets passed around the office when everyone has too much else to do, Salesforce can help make it streamlined and simple process. Using Salesforce in this way will not only help your staff, but your donors will also appreciate your ability to get the letter to them in a proactive manner. Starting utilizing these features in the NPSP today, or reach out to Cloud for Good if you need further assistance.